In panel conversations between musicians, researchers, journalists, organisers and promoters we found and heard about a range of approaches to trying to revitalise the (jazz) festival experience and the jazz scene at the 12 Points Festival discussion days on ‘Jazz Futures’ here in San Sebastian. 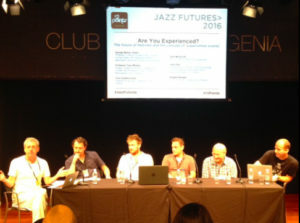 This was felt important for a number of reasons, including that in some countries the big all-star jazz festival is fading, its audience diminishing, while elsewhere, perhaps ironically, perhaps in a connected way, there is a surfeit of festivalisation of culture, in that festival in its ubiquity has become everyday, even banal, and no longer the intense, heightened and exceptional. Here are some of those diversifying approaches.